With spring around the corner many horse people are preparing to transition their horses from an all hay winter diet or range forage to the sugar rich spring grasses which the horses love of course. But not all horses can tolerate pasture grass as a forage, and for those who can tolerate it the transition should still be gradual and carefully done. Hay has more fibre and is generally lower in sugars than grass which is very high in both sugars including fructans. And since many equine diseases are associated with high sugar diets we need to exercise extreme caution. In addition, grass requires different species of probiotics than hay for effective digestion. But, most importantly, we have learned that our domestic pastures are not what they used to be and are therefore causing our horses a lot of grief. What’s In Our Grass Pastures? It used to be that the grass pastures were very suitable for our horses. But the quality has changed a lot over the last couple of decades because of the seed mixes and the various growing conditions. Whereas a horse’s natural grazing habitat on the range is native prairie grasses and slow growing bunch grasses the lush grass that most of our domestic horses are eating on a modern farm these days is much higher in sugars: i.e. glucose, fructose, and fructans. Sugars are the basic building blocks for plant growth as the plants use the simple sugars of glucose and fructose for energy to grow. One glucose molecule combined with one fructose molecule together makes a disaccharide called sucrose (sugar). And many sucrose molecules stuck together makes a polysaccharide which is what a starch is. And fructans are a type of starch which are a combination of primarily fructose molecules. And while simple sugars may be a natural part of the grass plant, fructans definitely are not! Consequently, horses find it very difficult to digest fructans because a starch of this type was never part of their natural food chain. So, as a result, fructans are implicated in a number of equine health conditions. How Is This “Modern” Grass Affecting Our Horses? 1. Sugar Metabolism. High levels of simple sugars causes a horse’s blood sugar to rise during or after eating. Sugar requires insulin secreted by the pancreas to open up glucose receptors in the muscles and the liver. This allows the sugars to move out of the blood and into the tissues for energy or for storage. Normally sugars are stored in the muscles and liver as glycogen, which is the storage form of sugar. From here the glycogens are converted back into sugar and released into the blood again when needed for energy. However, when the muscles and liver storage depots are full the receptors become resistant to insulin and will therefore not open to allow the sugars entry into the tissues. Sugars which cannot be stored as glycogen must now try and convert to fat instead. But in the face of a continuing diet that is high in sugar both blood sugar and insulin levels continue to rise, as does the body weight. This condition is known as insulin resistance (IR). But IR is responsible for more than just weight gain. Poor immunity, fatigue, thirst, increased appetite, increased urination, general inflammation, and body soreness are all signs of sugar metabolic problems. And, perhaps most significantly laminitis has now become an epidemic due to the destructive effects of sugar and insulin on hoof tissues. High sugar diets including grass make it impossible for these sore horses to become sound. See my blog on Insulin Resistance for more information. 2. Fructan toxicity. Even though fructans don’t raise insulin and blood sugar levels they do cause serious digestive issues. Horses digest all of their food including carbohydrates, proteins and fats, in the stomach and small intestine. Only fibre is passed into the hindgut where it ferments to produce energy and is the reasons why horses need so much fibre in their diets. And since fructan is a carbohydrate it should be digested in the small intestine as well. However, horses don’t have enough amylase (a digestive enzyme that digests starches) to digest it so the fructans are passed into the hindgut where they ferment instead. And because only fibre should be fermented in the hindgut any fermentation of starches results in toxins, acids, a low pH, heat, gas, mal-digested debris, and pathogenic bacteria and parasites. It also depletes the friendly bacteria (probiotics). This eventually causes cecal acidosis, aka leaky gut, which then damages the colon membranes and leaks toxins and acids into the general system. Leaky gut is frequently responsible for immune breakdown, skin problems, sore joints, respiratory symptoms, allergies, fatigue, and laminitis; one of the primary underlying causes of laminitis is leaky gut. So Why Does “Modern” Grass Contain Fructans? Because forage researchers wanted to focus on fattening up cows with the intention of increasing meat and milk production. So they bred grass plants that could store a type of starch that would promote early spring growth as well as increased growth, and to make them hardier to withstand environmental stress factors such as cold weather, low rainfall, poor quality soil, and artificial fertilizers. These high starch grasses are also low in fibre which increases hunger and makes animals eat more. Now this designer grass might work well for the beef and dairy industry but the digestion and physiology for a cow is very different than it is for a horse. And somewhere along the way, the plant scientists forgot that horses would be eating the same grass as the cows, and that these new high fructan plants would become very problematic for our horses. And since these grasses are now seeded across the continent our horses are paying a big health price to keep the cows fat. Which Horses Are Most Susceptible? At-risk breeds for sugar intolerances and metabolic sensitivities include all of the easy keepers which are usually ponies, desert breeds, and mountain breeds, all of which are metabolically adapted to survive in harsh, low-nutrient environments.Ponies, Minnies, Arabs, Paints, Mustangs, fjords, Icelandics, Morgans, Drafts, and gaited horses should be carefully monitored. However, all horses are at risk if they don’t get enough exercise, especially senior horses whose metabolic rate is lower. Those horses with Thoroughbred blood and younger horses are more tolerant, however unlimited grazing for any horse, regardless of breed or age, can be risky due to the fructans. And younger horses should be watched carefully for signs of joint problems. All horses with a history of Equine Metabolic Syndrome including Insulin Resistance and Cushing’s (PPID), laminitis, arthritis, or immune issues should be restricted from grass grazing or seriously limited until they have improved on a complete program which includes regular exercise. Nevertheless, grazing horses will usually get more exercise than those horses in dry lots which is something to consider since lack of exercise is a key factor in metabolic imbalances. When Is The Best Grazing Time? Fructans levels can vary from field to field, from season to season (sugars are highest in April, May, and June) and with the time of day. Grass creates sugar during the day using the light of the sun (photosynthesis), carbon dioxide, and water. These sugars are used as fibre for the structure of the plant and for energy to grow. But during the night without light the sugar sources are used up and become depleted. So, by very early morning the grass is much lower in sugars and fructans making it an optimum time for horses to graze. But by afternoon the sugars are at peak levels again. Cloudy days will produce less sugars but an overnight freeze may accumulate sugars even in the morning because freezing temperatures stunt growth. In fact, any factors that stress the growth of the grass plants will cause fructans to accumulate since the plant is then unable to use it for fuel. Thus, cold sunny days, lack of water (rain or irrigation), over-grazing, and depleted soils can quickly raise sugar levels. Many times people ask which types of grass seed are lowest in sugars and whereas there is some variety with the different seed mixes, it is actually the growing conditions as described above that has the most influence over the sugar levels. But allowing horses to graze in tall grasses will help because the horses will nip off the top of the plant rather than the bottom stems where more of the fructans are stored. It’s also interesting to note the fructan levels are high in wheat, barley, and rye which is another reason to not feed these grains nor their grasses to horses. Once you decide which horses can tolerate grass, when they can tolerate it, and for how long they can tolerate it you can support the hay to grass transition with a gradual introduction to help prevent blood sugar problems, hindgut issues, immune conditions, and hoof problems. Because hay and grass differ in types of sugar, starch, and fibre, as well as moisture content they each require different species of fermentative bacteria. This is why any time a horse’s diet is changed it must be done gradually to allow the different species of probiotics in the hindgut enough time to adapt rather than die off. No matter what time of year the horses make the transition, it is best to start them with twenty to thirty minutes of grazing for the first two or three days and then gradually increase by twenty to thirty minutes every day until they are up to four to five hours of grazing time. This generally takes ten to fourteen days. How much grass grazing a horse can tolerate is variable and depends on breed, level of exercise, lifestyle, health history, grass type, and the local climate. Some horses cannot be free-grazed at all while most others should be limited. The process of fermentation is accomplished with billions of units of various strains of bacteria. So to support any dietary transition horses should be supplemented with probiotics. Horses, perhaps more than any other species, rely on a high level of probiotics to maintain a balanced ecosystem in the gut and to ferment fibre for energy. A deficiency of probiotics can cause bloating, colic, diarrhea, bacteria and yeast infections, poor immunity, unhealthy weight loss or gain, and poor nutrient absorption. Thus, in all cases of dietary changes, digestive problems, leaky gut, weight changes, insulin resistance, and laminitis horses should be replenished with live bacteria. And probiotics should be provided for all grazing horses because high sugar diets deplete probiotics much quicker than hay only diets. We therefore recommend supplementing your horse with Riva’s Pro-Colon. It contains a blend of prebiotics and probiotics which has proven to be very beneficial for all horses. Give ¼ tsp daily for 4-6 weeks. This can be done two – four times per year depending on your horse’s diet and gut health. 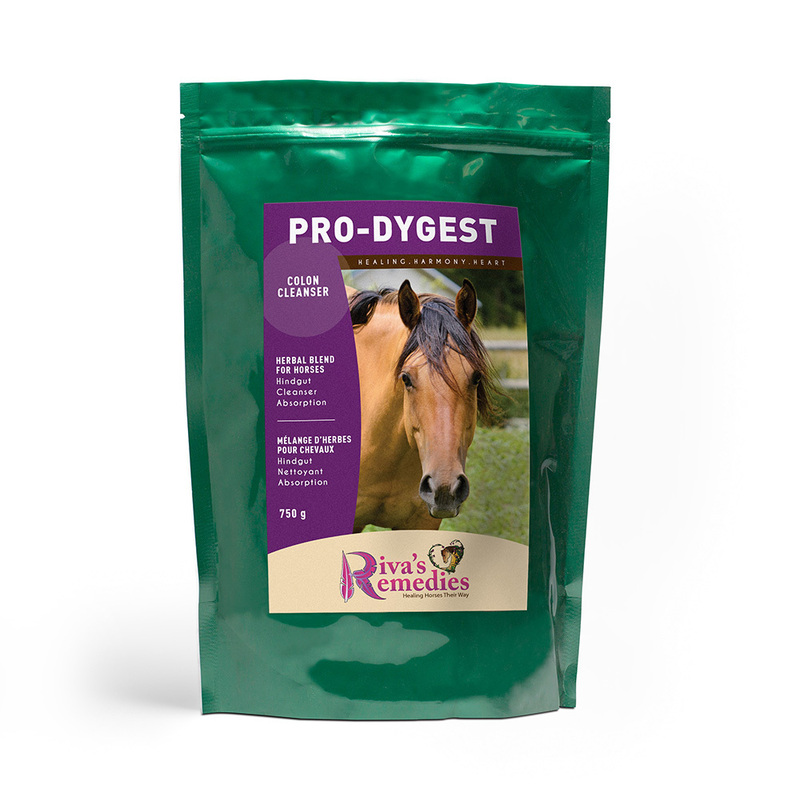 And if you suspect that your horse is dealing with leaky gut add the Pro-Dygest herbal blend as well to cleanse and detoxify the hindgut. Keep in mind that the best quality probiotics are those that need refrigeration. This ensures maximum potency. Riva’s Remedies Pro-Colon is kept refrigerated right up to the point of shipping and is specifically formulated for horses. Once you receive the Pro-Colon keep it refrigerated. To maximize your horses’ health ensure that they have a varied diet, a low-sugar diet, nutritional supplements to prevent deficiencies, plenty of exercise, lots of friends, and a high-quality probiotic. And while grazing can be very good for the physical and psychological health of the horses do be mindful of the effects of grass forage on all horses.